One morning in February, Henry woke up and looked out of his window and found wet yuck. It was one of those gray days that isn't Winter (with snow and exciting outdoor fun), but really isn't anything else either. What to do on a gray, wet weekend? Henry was bored. His big dog Mudge was bored. Even Henry's father was bored. Then, Henry's mother had an idea -- a fun, creative, whole-family idea. They could use the cardboard boxes the new refrigerator and the stove came in to make a castle. "It has to have turrets," Henry's father said. "And a drawbridge. And Buttresses. And flags." "Dad," said Henry, "it's just a refrigerator box." "Not for long," said Henry's father. They got to work building the castle in the basement - planning, cutting, stapling, and painting. Henry's big dog Mudge joined them and chewed on a boot. Suddenly it wasn't a long, boring weekend anymore. When the castle was finished, Henry and his father pretended to be knights, and Mudge was the king. This is my favorite of the Henry and Mudge series. I love the idea of the entire family working on such a fun, creative project. 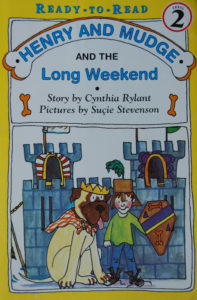 Like the other Henry and Mudge books, this one is perfect for beginning readers.